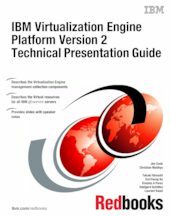 This IBM Redbooks publication provides foils and technical information presented as speaker notes that describe all the existing virtualization features and products included in the IBM Virtualization Engine Version 2. The IBM Virtualization Engine is the IBM delivery vehicle of the virtualization concepts; it includes innovations in resource virtualization as well as management, performance, modelling and visualization services for the infrastructure components in an heterogeneous environment. A new version of the Virtualization Engine has been detailed in November 2005. The Virtualization Engine platform provides the foundation to build an infrastructure more simple to manage; it is based on open interfaces and industry standards. It provides a set of blocks for progressively building business oriented solutions, allowing clients to start where they want and to evolve at their own pace. This new version is made of Virtual Resources which are integrated into the IBM systems and Virtual Management and Access components which are a multi-platform offering of system tools for a variety of operating system environments. Some of the components are available since December 2005; other components will be made available early in 2006. This book is suitable for IT architects and for IT specialists who want to understand how the virtualization components fit into the Service Oriented Architecture, to understand the products offerings in detail or to plan a project that includes the use of these features and products.